The 49er, 49erFX and Nacra 17 classes raced their Miami Skiff Midwinter Championships prior to the Hempel World Cup Series Miami. Britain’s John Gimson and Anna Burnet dominated the Nacra 17 event, winning four of the eight races. They finished 14 points ahead of Jason Waterhouse and Lisa Darmanin of Australia, with Rio gold medalists Santiago Lange and Cecilia Carranza Saroli of Argentina in third place. The 49er event was won by Spain’s Diego Botin and Iago Marra ahead of Benjamin Bildstein and David Hussl of Austria and Jakob Meggendorfer and Andreas Spranger of Germany. Britain’s James Peters and Fynn Sterritt finished in eighth place, picking up a win in the final race. Other GBR results – Morgan Peach and Rhos Hawes were 17th, Dylan Fletcher and Stu Bithell 19th, and Jack Hawkins and Chris Thomas also taking a race win (and a couple of BFD) to finish 22nd. 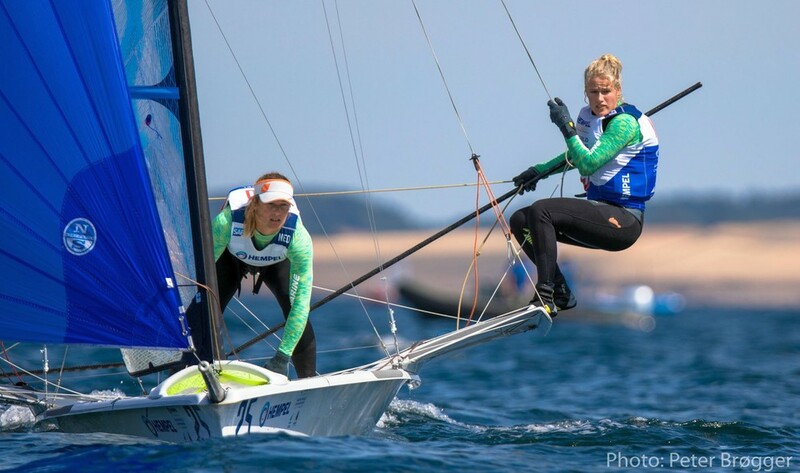 In the 49erFX Martine Grael and Kahena Kunze of Brazil took the overall victory, ten points clear of Stephanie Roble and Maggie Shea of the USA. Third were Odile van Aanholt and Marieke Jongens of Holland. Charlotte Dobson and Saskia Tidey were the only Brits to race, they finished 20th.